Cagayan is not only the home of the First Filipino. It is likewise the bastion of religiosity and architectural grandeur. Truth is, when Spanish conquerors bore sword and cross in the entire length and breathe of the province, they effectively established their stronghold as they dotted small settlements with churches from Namuac in Sanchez Mira up northwest, to Tuguegarao in the south. The magnificent edifices dwarfed the grass and hardwood nipa shacks of the subservient Indios, who the conquerors observed, have a rather queer tongue like the birds of yore. Among the provinces of Cagayan Valley today, it is in Cagayan where the Spaniards left an indelible mark as signified by majestic iconic structures like the centuries-old St. Peter’s Metropolitan Cathedral, among others. On rather cold mornings amid the threat of global warming which hang like the sword of Damocles over humanity, the silhouette of the cathedral looms like a jealous sentinel over an early smog enveloping the premier city of the Ibanags. For all its architectural, religious and historical worth, the cathedral of the Ibanags is truly a work of art. Its exteriors, particularly the façade, speak well of the artistry of a priest-builder who may have thought that he was an Ibanag and went by the name Father Antonio Lobato de Santo Tomas, O.P. The church’s Solomonic columns along the facade and accentuated by a giant letter ‘S’ can be a toast of today’s architectural mastery. Its Baroque interiors dotted by various Dominican Pontifical motifs on the wall makes it a must-see heritage site for its rarity. Andrea Atienza of Sarimanok magazine wrote that the clay was fired at high temperatures in large kilns to produce tough, excellent bricks that could be used not only for structural purposes but for the exterior facing. “The builders have in their hands a versatile vehicle for their decorative efforts as a well as a medium for a more fluid architectural style,” she said. But the church has seen better days. For all we know, the letter ‘S’ on its façade is the result of a plaster done during some restoration days after the Second World War when the church was razed to the ground leaving a smoke of uncertainty. The unique hallmarks of the church include the use of hard brick exposed to the exterior and bound by lime mortar, a pediment pierced by a rose window and decorated by three finials on each side and the wave-like pattern that cascades from the apex. Some parts of the walls have cracked over the years because of the elements. In fact, some wild Ficus plants have started to call the walls its home for the last few decades. Along this cracking of the structure is the perceived symbolic crack of faith. 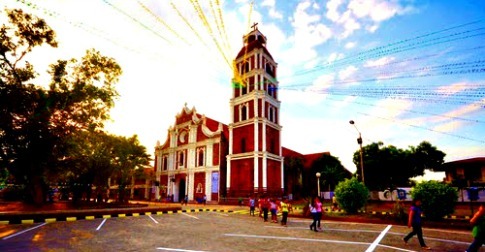 As a young boy of Barangay Ugac Norte, I used to explore the bell tower of the cathedral with its unique and manually constructed spiral brick stairs leading to the top. From there, we could see the panoramic view of the entire Tuguegarao City and further south, the municipality of San Pablo with its equally majestic church of St. Paul ruins accentuated by the snaking Cagayan River at the foreground. We have tried the ‘flying’ buttress at the back of the church sanctuary but were never successful. The tower’s façade was made of exposed bricks which were smaller than the usual bricks manufactured by the nearby horno (brick kiln) at Barangay Bagumbayan. Unfortunately, the beauty of the old horno gave way to a barangay gymnasium, perpetually eclipsing the historic footprint along the banks of the mighty yet turbulent Cagayan River. On quiet summer afternoons, only the chirping of the church birds which declared the church their property and fighting over a twig, cuts the supposed silence of the church. Occasionally, a few kalambag (small bats) join in the crime. By now, the entirety of the church has lost most of its original designs that the religious could only wish for some miracles to happen to save the structure from its continuing decay. As if the heavens answered, a movement has been hatched as early as last year. “We have finalized various plans and efforts for ambitious restoration work,” Parish Priest Monsignor Gerard Ariston Perez said. The decision came after the Permanent Committee for the Cultural Heritage Church of the Catholic Bishops Conference of the Philippines initiated a massive research on the 1767 Spanish church. It tried to unlock the extent of damage brought about by the passing of time aided by the ravages of the last world war. It’s all systems go for the launching of the “I Am The Rock” Restoration Campaign through a fun run dubbed as “Takbo Para Kay San Pedro”. Perez disclosed that it is not only the structures which will be restored. The campaign likewise will try to bring back Tuguegaraoenos to the folds of the Roman Catholic faith. Admittedly, Perez claimed the project is ambitious and will need a sustainable campaign platform to raise funds. This early, the restructuring of the retablo (altar) has since been started.